CLEMSON, S.C. — Clemson (15-2), fresh off a three-game sweep of Ohio this past weekend, plays host to East Carolina (17-3) at Doug Kingsmore Stadium Tuesday at 3:00 PM and Wednesday at 7:00 PM. Wednesday’s game will be broadcast live on Fox Sports Net South. A detailed pre-game outlook will be posted on Monday. This year, Clemson offers special promotional considerations to select fans. Clemson offers a Businessperson Special on all weekday day games at Doug Kingsmore Stadium, where any fan who presents his/her business card will receive free admission. All Sunday home games are Senior Citizens’ Day, where any fan who presents his/her AARP card will receive free admission. Also on Sundays, all youngsters are invited on the field during the national anthem to stand next to their favorite Clemson player. Ticket prices for home games are $5 for adults and $2 for students. Clemson students who present their student ID will receive free admission. Clemson swept Ohio by scores of 9-4, 6-1, and 16-2 from Mar. 10-12. The two teams played a doubleheader on Mar. 10 due to the threat of inclement weather on Mar. 11. Game three got underway on Mar. 11, but only two full innings were completed. Game three was finished on Mar. 12. Clemson outscored Ohio 31-7. Ohio entered the games averaging nearly nine runs per contest. Ohio left 34 runners on base in the series. In game one, Scott Berney picked up the win, as he allowed two runs in 7.0 innings. His scoreless streak ended at 32.2 innings on an RBI fielder’s choice by Cory Keylor in the third inning. Ohio and Clemson both stranded 11 runners on base. Khalil Greene led the Tigers with three separate run-scoring singles. Keylor led the Bobcats with three hits and an RBI. Game two featured more stranding, as Ohio left 12 runners on base and could only score one run. Clemson scored all six of its runs in its final three innings at the plate. Greene’s run-scoring fielder’s choice and a passed ball by catcher Jeremy Johnson gave the Tigers a 3-1 lead in the eighth inning. Ryan Childs, making his first career start, pitched 4.1 innings without allowing an earned run. Freshman reliever Paul Harrelson notched his first career win by pitching 2.2 shutout innings. Nick Glaser earned his seventh save by striking out five in 2.0 innings of work. Game three saw the Tiger bats come alive to the tune of 15 hits in Clemson’s 16-2 win. Justin Singleton, who entered the game 1-for-28 in 2000, went 3-for-5 with a triple and four RBIs. Khalil Greene added three hits, and Jeff Baker had two hits and three RBIs. Jarrod Schmidt, who relieved Ryan Mottl when the game resumed Sunday, pitched 4.2 scoreless innings with six strikeouts to earn his first career victory. Ohio left 11 runners on base while Clemson stranded 14, inlcuding at least one in all eight innings. Bobcat pitchers walked Clemson batters 12 times and hit two Tigers. Jack Leggett picked up win #300 at Clemson as the Tigers rallied to down William & Mary 10-6 on March 8. Clemson lead 5-1 before the Tribe tied the score at 5-5 in the seventh inning. But Casey Stone and Patrick Boyd each had two-run singles in the eighth to preserve the win. Matt Additon pitched 2.0 scoreless innings in relief to pick up the win. Steve Reba started, but did not factor in the decision. Reba’s 10.1 hitless and 13.1 scoreless inning streaks ended in the contest. Boyd led the Tigers with three hits, two runs scored, and four RBIs. Five other Tigers had two hits apiece. 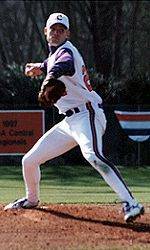 The Clemson pitching staff struggled in 1999 with its team ERA of 5.82. But already this season, there is a noticeable difference in every area thanks to the leadership of veteran Tigers in Scott Berney and Ryan Mottl. In fact, Clemson has yet to allow more than six runs in a single game. Other notables include throwing just five wild pitches and allowing just 27 extra base hits. Below is a comparison of the team’s stats from 1999 and 2000. In this day in age in college baseball where football-like scores seemingly dominate the scoreboards, it is rare to come across a team that has given up just one home run through 17 games. The lone homer was by Central Florida’s Mike Fox. Fox was, ironically, the ninth batter in the Golden Knight’s lineup. Many people have speculated that the bats this year have had some of the power taken out of them. Also, Doug Kingsmore Stadium is one of the larger fields in terms of distance to the fence. Furthermore, consistent winds ranging from 10 to 20 miles per hour have blown straight in from centerfield in almost every inning at Doug Kingsmore Stadium this season. 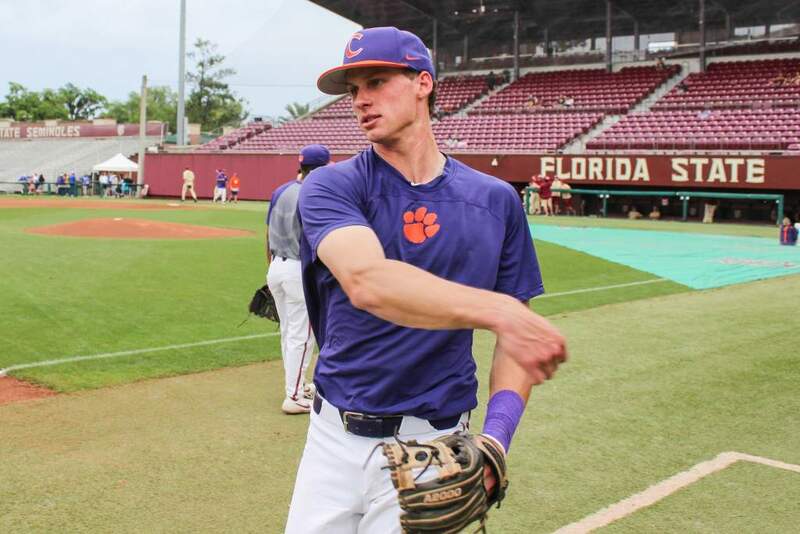 Add to the fact that pitchers like Scott Berney, Nick Glaser have been at the tops of their game, it is easy to see why no opposing player has hit a home run at Clemson this season. On the other hand, Clemson has only hit four homers. Michael Johnson hit two long balls in one game against Old Dominion on Feb. 20. Patrick Boyd and Mike Calitri each hit a homer against UNLV on Mar. 3. It had to end sooner of later. Senior righthander Scott Berney had not allowed a run in 32.2 innings pitched this season until Ohio’s Cory Keylor reached on a fielder’s choice with two outs, allowing a run to score. The 32.2 inning streak still ranks atop the Clemson recordbooks. Randy Quintrell held the record with 24.0 consecutive scoreless innings in 1975 and Ron Musselman (1976,77) was second with a 21.1 inning streak in ’77. Kris Benson’s longest scoreless streak was 19.1 during his incredible 1996 season. Benson was drafted #1 overall in the Major League Draft in ’96. While Berney may not have the scouts drooling like Benson did, Berney gets the most out of every pitch with accuracy and ability to keep batters off balance. In three seasons at Connecticut, Berney had a 2.45 walks per nine innings pitched mark and he has kept that consistency with a 1.7 mark in 2000. He also threw just four wild pitches at Connecticut and has yet to throw one as a Tiger. Saying Ryan Mottl junior season was a disappointment is an understatement. The righthander, who was 19-7 entering his junior season, was 4-8 with a 6.14 ERA. Mottl worked hard in the offseason and he has found his form again to the tune of a 4-0 record and 1.37 ERA. He has allowed 13 hits, four runs, five walks, and a .149 opponent batting average while striking out 24 in 26.1 innings in 2000. He has also only yielded one hit in 27 at bats with two outs. Mott’s 27 career wins is tied for fourth-best in Clemson history. He also has 303 career strikeouts and became just the sixth Tiger to reach the 300-strikeout mark. Sophomore righty Steve Reba has allowed just six hits and one earned run in 15.2 innings this season. That equates to a 0.57 ERA and .115 opponent batting average. He went the first 13.1 innings of 2000 without allowing a run and had a streak of 10.1 consecutive innings where he did not allow a hit earlier this season. Reba has thrown 26 ground-ball outs compared to just three fly-ball outs. Reba, who has shown more consistency with his sharp-breaking slider in 2000, is expected to be a weekday starter during the season. Junior righthander Nick Glaser transferred to Clemson from Edmonds CC in Washington with the hopes of making an immediate impact. He has done just that as he already has seven saves in nine appearances. He has allowed just six hits, no earned runs, three walks, and a .176 opponent batting average along with 16 strikeouts in 10.1 innings. He exudes the typical closer personality with his slingshot-type delivery and fiery attitude. When he trots to the mound from the bullpen and while he throws his eight warm-up pitches, “Enter Sandman” by Metallica is blared over the loudspeakers. If you look closely, you might even see steam coming from Glaser’s ears. His seven saves already places him tied for sixth in saves in a season in a Tiger history. Junior All-America centerfielder Patrick Boyd slumped in the early going of 2000. He did not play summer ball and saw limited action in fall due to some nagging injuries. In Boyd’s first 17 at bats of 2000, he had only one hit. But in the 13 games since that slump, he has nine multi-hit games and has raised his batting average to .328.